The south cross is the cross on the hill, which is the high point, south of the village. The site is situated some few hundred yards east of the old Parochial House, now a private residence. There is a large mound of earth on which the tall cross stood, so from here one could view a large area of the parish. 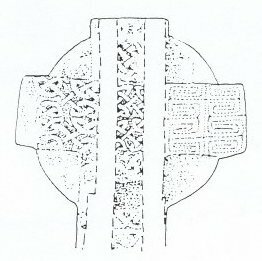 George Petrie said that this cross stood at the south of the Ennistymon road - a quarter of a mile from the present extremity of the town - that it fell in 1820 and was sent to Killaloe in 1821 at the desire of the Bishop of Killaloe and re-erected there. Dr Richard Mant was appointed Bishop of Killaloe and Kilfenora in 1820, so in that year he set out on a visitation of his two diocese. In early August he arrived in Kilfenora which he described as “the worst village that I have seen in Ireland and in the most desolate and least interesting country,” so the history of this cross is of its removal to Killaloe. From a historical point of view one wonders was the cross, when in Kilfenora, standing on Church property, for it was some distance from the Cathedral grounds. Could this open field have been in private property then, as it is today? This cross in Killaloe is a solid-ringed type of cross being over four metres in height, and tapering slightly from base to top. It was broken in three places, so holes were drilled through the shaft to repair and fix it to the wall. The exposed figure of Christ is the main feature of the cross. 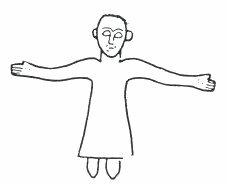 It is not a crucified figure, as some might suggest, for the figure stands erect, the arms fully extended and the feet point downwards. 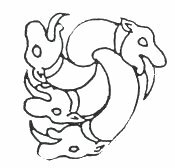 It is dressed in a long robe with long sleeves and around the figure are three triangular knot patterns, while the fourth is a motif ending in beasts’ heads. In the area over the figures’ heads is a rectangular area of knotwork, while beneath Christ’s feet is a square panel of fretwork. The remainder of the shaft is blank. This cross has again been on the move, for in 1998 it was re-erected a short distance inside the Cathedral door, after being repaired by the Office of Public Works at their shop in Galway, so now one can view both sides of the cross, and we can see at the top of the cross a lightly carved area of knotwork and plaitwork. If the cross is ever moved again we hope it will return to its birthplace.